Octinoxate (4.9%), Titanium Dioxide (2.9%). Water\Aqua\Eau, Isododecane, Cyclopentasiloxane, Dimethicone, Butylene Glycol, Polymethyl Methacrylate, Trioctyldodecyl Citrate, Polysilicone-11, Coco-Caprylate/Caprate, PEG/PPG-18/18 Dimethicone, Polyglyceryl-4 Isostearate, Sodium Hyaluronate, Ascorbyl Palmitate, Cetyl PEG/PPG-10/1 Dimethicone, Hexyl Laurate, Quaternium-90 Bentonite, Dimethicone Silylate, Magnesium Aluminum Silicate, Alumina, Silica, Propylene Carbonate, Sodium Chloride, Caprylyl Glycol, Hexylene Glycol, Stearic Acid, Palmitic Acid, C12-16 Alcohols, Hydrogenated Lecithin, Disodium EDTA, Phenoxyethanol. May Contain: Mica, Titanium Dioxide (CI 77891), Iron Oxides (CI 77491), Iron Oxides (CI 77492), Iron Oxides (CI 77499). 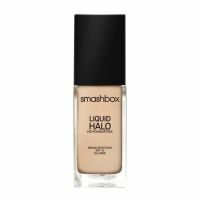 doesn't break me out some good ingredients for skin doesn't create lines oxidizes sometimes expensive the old HD foundation formula was better I have some issues with smashbox foundations, but I always return to them because I haven't yet found anything better. They are pricey and tend to oxidize, so I can never match my shade. You need to wear a primer with it to make it last longer, but if you have oily skin you can go without. Sometimes a setting powder is needed to combat shine, but I haven't had any major problems with that. Overall, it covers quite well and lasts a long time. My face looks flawless in pictures whenever I wear this foundation.